Peripheral dog granulocytes stained with Mouse anti Dog CD107b:RPE (MCA2558PE) following permeabilisation with Leucoperm® (BUF09). Peripheral dog granulocytes stained with Mouse anti Dog CD107b (MCA2558GA) following permeabilization with Leucoperm® (BUF09). 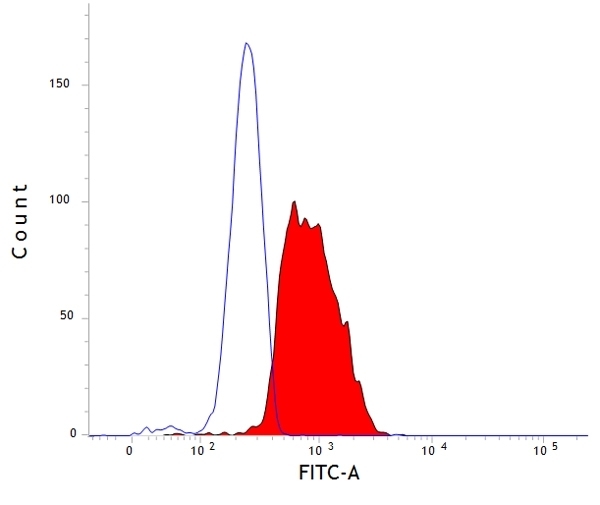 Goat anti Mouse IgG (H/L):FITC (STAR117F) used as secondary antibody. Mouse anti Dog CD107b antibody, clone AC17 recognizes canine CD107b, otherwise known as lysosome-associated membrane protein 2 or LAMP-2. Immunofluorescence staining of MDCK cells with mouse anti dog CD107b, clone AC17 demonstrates staining patterns consistent with localization to lysozomes. This is supported by coincident staining of an exogenous lysozomal glycoprotein, avian LEP100 transfected into MDCK cells and detected using the anti LEP100 antibody clone CV24 (Nabi et al.1991). Mouse anti Dog CD107b antibody, clone AC17 immunoprecipitates a protein of ~95 kDa in MDCK cells which, following Endo F digestion to remove N-linked oligosaccharides, yields a core protein product of 40 kDa, indicating the heavily glycosylated nature of CD107b. The molecular weight of canine CD107b is typical of many lysozome-associated membrane proteins. While most (97%) CD107b resides in the lysozomal environment in adherent MDCK cells in vitro, early studies (Nabi et al.1991) indicated that a small percentage of total cellular CD107b, as revealed by radioimmune assay with clone AC17, is found associated with the cell membrane. Lysosomes are membrane-bound organelles found within the cytoplasm of most cells, they contain hydrolytic enzymes and act as the major compartment for heterophagic and autophagic digestion. Members of the lysosomal-associated membrane protein family (LAMPS) are believed to play an important role in protecting the lysosomal membrane from protease degradation and are involved in lectin-mediated cell adhesion. CD107b has been shown to share high N-terminal amino acid sequence homology with human, mouse and rat CD107b (Nabi et al.1993). Transfection of a mink type II lung epithelial cell line with beta1-6-N-acetylglucosaminyl transferase V demonstrates the formation of large lysozomal vacuoles, termed multilamellar bodies (MLBs), having a very distinct phenotype with expression of CD107b, as indicated by immunofluorescent staining with clone AC17. These MLBs require lysozomal degradation via an autophagic pathway for their formation and may have implications for lysozomal storage diseases (Hariri et al.2000). Evidence shows that CD107b is involved in the lysosomal uptake of cytosolic proteins and the endocytic pathway. Human studies have revealed a correlation between the level of surface expression of CD107b on tumor cells and their metastatic potential (Saitoh et al. 1992). Mouse anti Dog CD107b antibody, clone AC17 has been shown as suitable for use in electron microscopy (Nabi et al.1991). Nabi, I.R. et al. (1991) An endogenous MDCK lysosomal membrane glycoprotein is targeted basolaterally before delivery to lysosomes. J Cell Biol. 115 (6): 1573-84. Nabi, I.R. & Rodriguez-Boulan, E. (1993) Increased LAMP-2 polylactosamine glycosylation is associated with its slower Golgi transit during establishment of a polarized MDCK epithelial monolayer. Mol Biol Cell. 4 (6): 627-35. Jou, T.S. et al. (2000) Selective alterations in biosynthetic and endocytic protein traffic in Madin-Darby canine kidney epithelial cells expressing mutants of the small GTPase Rac1. Mol Biol Cell. 11 (1): 287-304. Ihrke, G. et al. (2001) Competing sorting signals guide endolyn along a novel route to lysosomes in MDCK cells. EMBO J. 20 (22): 6256-64. Pluhar, G.E. et al. (2010) Anti-tumor immune response correlates with neurological symptoms in a dog with spontaneous astrocytoma treated by gene and vaccine therapy. Cliffe, S.T. et al. (2009) SLC29A3 gene is mutated in pigmented hypertrichosis with insulin-dependent diabetes mellitus syndrome and interacts with the insulin signaling pathway. Hum Mol Genet. 18: 2257-65. Bai, Y. et al. (2011) Intracellular neutralization of viral infection in polarized epithelial cells by neonatal Fc receptor (FcRn)-mediated IgG transport. Proc Natl Acad Sci U S A. 108 (45): 18406-11. Nagahama, M. et al. (2011) Cellular vacuolation induced by Clostridium perfringens epsilon-toxin. Nagahama, M. et al. (2012) Intracellular trafficking of Clostridium perfringens iota-toxin b.
Hariri, M. et al. (2000) Biogenesis of multilamellar bodies via autophagy. Mol Biol Cell. 11: 255-68. Fukuda, M. (1991) Lysosomal membrane glycoproteins. Structure, biosynthesis, and intracellular trafficking. J Biol Chem. 266 (32): 21327-30.